I'm 46 years old, and I was diagnosed with rheumatoid arthritis at 43. When I was in my teens and twenties, I was living on ramen noodles and bricks of Cracker Barrel cheese, pulling all-nighters to either study or party, and my health was not my top priority. My three guests have a very different life experience. 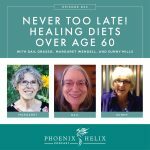 They were all diagnosed with their autoimmune disease at a young age, and they chose the impressive path of healing through diet and lifestyle. 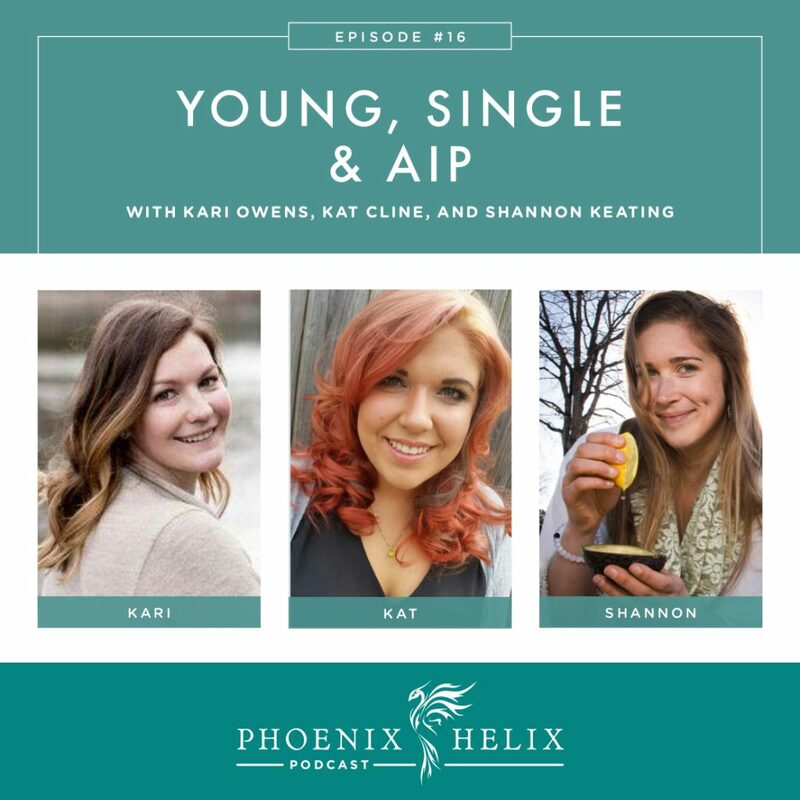 Today, we'll be talking about the blessings and challenges of living an AIP life when you're young and single. Shannon Keating is the blogger behind Nutrition Uplifted. She's 22 years old, in college, and developed bodywide psoriasis at age 20. Interestingly, she was paleo at the time. It wasn't until she started focusing on nutrient-density and added the autoimmune protocol that her psoriasis healed. Now, all that remains are a few small scars on her legs. Kat Cline is the blogger behind The Primordial Table. She's 26 years old, works as a hair stylist, and has psoriasis, psoriatic arthritis, and endometriosis. 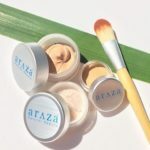 Her psoriasis symptoms first appeared at age 22 in a mild form, and then became severe at age 24, resulting in hair loss and joint pain as well. Like Shannon, Kat was paleo when her symptoms appeared, and it wasn't until she went AIP that they started to improve. Nightshades are a big trigger for her, and so is stress. Kari Owens is the blogger behind Kari Owens. She's 24 years old, works as a consultant, and was diagnosed with ankylosing spondylitis at age 15. Her progression of symptoms was swift, and she was disabled within 3 months. She was put on biologic immunosuppressant medication which put her into remission. However, over the years, remission came and went, and eventually her symptoms worsened in spite of medication. That's when she tried paleo. The regular paleo diet alleviated her pain, but tests showed that her disease was still progressing. She's now following the AIP with a focus on nutrient density. Her hope is that she will achieve complete remission. She is currently medication-free. Shannon: Have an understanding that you each buy your own food. When it comes to junk food temptations, she doesn't see that as food any more and doesn't crave it. Kat: Type up a list of kitchen rules and post it on the fridge. They don't need to understand why; they just need to know it's important to your health, and that's an easy reference of dos and don'ts. If you are the one interviewing for roommates, also put those rules in the roommate agreement. Kari: Her paleo roommate was her father. She was the cook, and he willingly ate paleo meals. Kari: When she was younger, she wasn't comfortable sharing her diagnosis. For the past year, she consciously stopped dating, to focus on her own health and make herself a priority. Now, she's becoming interested in dating again, but it's a vulnerable feeling, putting herself out there. Kat: Some guys thought her diet made her too high-maintenance, so she tends to wait to share that information for a few dates in. She's actually had good luck with men who have dated vegetarians or vegans in the past, because they're used to different diets and are just excited you still eat meat. A guy's attitude toward your diet is a good screening tool for whether they are worth your time. Shannon: Like Kari, she also took some time off dating to focus on herself and healing. She also wanted to gain confidence about being paleo and be able to talk about comfortably, before sharing her choice with others. Now, she has a boyfriend. She didn't tell him about her diet until they got more serious. She chose paleo-friendly restaurants for their dates. Shannon: Her friends are supportive of her choice to heal through diet and lifestyle, but it's hard to be in your 20's, and go to bed early, and turn down alcohol, when everyone else is doing the opposite. It helps if you have one friend willing to stay sober with you. Kari: Sharing her autoimmune diagnosis with friends, and their seeing its impact on her life, deepened their friendship. They were very supportive when she decided to go paleo to feel better. However, it's hard for other people to really “get it.” Kari now plans their friendship “dates” for things that don't involve food, like exploring parks, or even typical tourist activities she wouldn't normally do, but are a lot of fun. She took her friends on an airboat ride to see alligators, and they loved it. Kat: Some of her friends tease her, but they also accept her diet as part of who she is. While not all of her friends understand, she chooses to spend time with the ones who do. Two favorite activities are shopping or playing pool, and Kat brings her own snacks. She also joined a “crunchy” group that is full of all-natural people who understand food intolerances. They hold potlucks with ingredient cards in front of each dish, so everyone knows what food is safe for them to eat. Kat: She bought a second-hand deep freezer, and when something goes on sale, she buys in bulk. She gardens, which results in fresh, cheap, organic veggies. She knows which stores sell which foods the cheapest in her town, and shops accordingly. Kari: Her menu plans are tentative, and she'll change it based on what she finds on sale. She also notes that the most expensive paleo ingredients are things like special flours and paleo packaged goods. She stays away from those and puts her money toward high-quality meats and vegetables. Shannon: In the dining hall, focus on filling your plate with meat, vegetables and fruit. The salad bar is a great choice. For cooked vegetables, choose steamed over sauteed, to limit your refined oils. In your room, keep a stash of canned sardines, tuna, salmon, and oysters. You can cook sweet potatoes and spaghetti squash in the microwave. Stock some healthy fats. Jerky also makes a great snack. And keep some raw fruits and veggies in a small fridge. Do the best you can. Kari: Draw on whatever support network you have. Remind yourself of what is going right in your life, and that you aren't completely defined by your disease. It's a good time for a gratitude journal. Kat: In the middle of a flare, it can feel overwhelming to take care of yourself. Plan ahead and stock your freezer with bone broth, soups, and emergency meals, so you can just defrost them and have healing food at your fingertips. 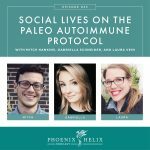 Resource: Autoimmune Connection Video Series (Both Kat and Kari were interviewed for the Arthritis episode). 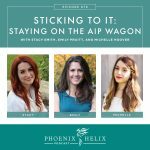 Kat: She started the AIP to reverse autoimmune disease, but it stabilized her mood issues at the same time. She's much happier than she's ever been. She's also grateful she halted the progression of her autoimmune disease before it became disabling. Kari: After 10 years of living with autoimmune disease, she feels she understands her body better than ever before, and it's empowering to take her health into her own hands. She also likes being part of a community of people doing the same; she no longer feels isolated by her disease. Shannon: Starting this lifestyle so young sets her up for abundant health later in life. She also likes being a role model for other young people, showing them an alternative path to healing that doesn't involve medication. Shannon blogs at Nutrition Uplifted. Kat blogs at The Primordial Table. If you haven't subscribed to my podcast: (1) Click the purple podcast icon. (2) In the lower right corner, click the magnifying glass. (3) Type Phoenix Helix in the search box. (4) Click the podcast cover in the Show list. (5) If you'd like to subscribe, click the purple Subscribe button. (6) To write a review, scroll down the page, and you'll see Ratings and Reviews. Scroll down a little bit more and click on Write a Review. This will bring up the review screen. Tap 5 stars (if you love the podcast), and then click in the title box, and it will bring up the keyboard. Enter a title and short review. (5) Click Send in the upper right corner. (6) Thank you! Positive reviews give the podcast a higher search ranking in iTunes, helping people find it and letting them know it's a quality podcast and worth their time to listen.